Welcome to Transpo Industries, Inc.
Transpo manufactures and supplies transportation safety products and state-of-the-art materials for airports, bridges, roadways, tunnels, and railways. A world-wide leader in the transportation industry, Transpo’s safety and rehabilitation products and materials are widely recognized for their quality, performance and reliability. Since 1968, our company and our innovative professional team has been dedicated to providing the finest products and materials to ensure safer and more forgiving transportation infrastructure. Transpo Products Are. . .
Our products are not only made to last, they come with the confidence derived from years of knowledgeable and reliable customer service. Our dedication to highway safety has helped reduce highway injuries and fatalities across the nation for decades. A leader in transportation safety, maintenance and preservation that dates back to 1968, our management team are the experts that the experts go to for information. Our team will work with you to create a smart solution for your next project. What we won’t try to do is sell you a product that doesn’t meet your needs. That is not who we are. We are here to help you find the right solution for your projects. Constant vigilance in airfield safety is a fact of today’s airports. Transpo produces state-of-the-art products and materials designed to improve airfield and runway safety. Transpo understands the hazards of the road. We take pride knowing our roads & highway products are tested and proven to ensure safer roadway infrastructure. All around the world there are bridges and tunnels that are in dire need of rehabilitation. 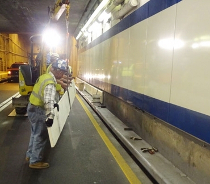 Transpo’s preservation materials and precast products may be the solution. Transpo is known for providing innovative and proven products to minimize maintenance and enhance safety at railway grade crossings. +Transpo manufactures light-weight and fast curing high quality polymer overlay systems. 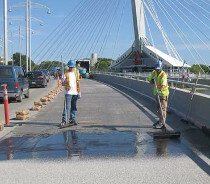 Our extensive line of polymer concrete materials and products enables us to meet specification performance requirements for virtually any overlay project ensuring bridge deck safety and increased service life. Transpo manufactures light-weight and fast curing high quality polymer overlay systems. 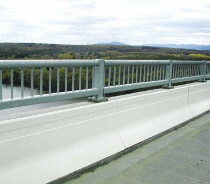 Our extensive line of polymer concrete materials and products enables us to meet specification performance requirements for virtually any overlay project ensuring bridge deck safety and increased service life. 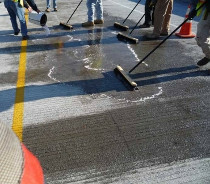 +Color-Safe® Durable Pavement Markings are the most cost effective, high definition color markings on the market today. This MMA material is your solution to long lasting pavement marking requirements. 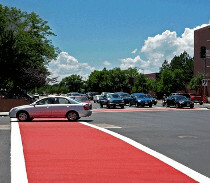 Color-Safe® Durable Pavement Markings are the most cost effective, high definition color markings on the market today. This MMA material is your solution to long lasting pavement marking requirements. +Transpo is the distributor of Energy Absorption Systems products throughout the United States Northeast. Our mission is to help professionals plan, engineer and install safety products. Transpo is the distributor of Energy Absorption Systems products throughout the United States Northeast. Our mission is to help professionals plan, engineer and install safety products. +'The Name Says It All'. Transpo Industries Color-Safe® is a methyl methacrylate (MMA) resin system used to produce the most durable, cost effective, high definition color airfield markings on the market today. 'The Name Says It All'. 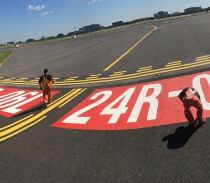 Transpo Industries Color-Safe® is a methyl methacrylate (MMA) resin system used to produce the most durable, cost effective, high definition color airfield markings on the market today. +Blast-Safe® Jet-Blast and Perimeter Security Fencing was originally developed for NASA to protect a launch site control tower. Today this state-of-the-art aviation safety system protects pedestrians, ground vehicles and airport facilities from dangerous jet-blast hazards from nearby aircraft. Blast-Safe® Jet-Blast and Perimeter Security Fencing was originally developed for NASA to protect a launch site control tower. Today this state-of-the-art aviation safety system protects pedestrians, ground vehicles and airport facilities from dangerous jet-blast hazards from nearby aircraft. +Pole-Safe® Omni-Directional Breakaway Support System features couplings designed to be used on poles located within roadside clear zones and other locations vulnerable to impacts, such as airfields. 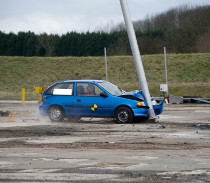 Pole-Safe® Omni-Directional Breakaway Support System features couplings designed to be used on poles located within roadside clear zones and other locations vulnerable to impacts, such as airfields. +T-17 is used on airports around the country for fast permanent repairs* to runways and taxiways. Emergency repairs in the runway safety area are both costly and disruptive to airport operations. 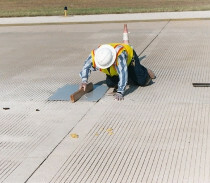 T-17 is used on airports around the country for fast permanent repairs* to runways and taxiways. Emergency repairs in the runway safety area are both costly and disruptive to airport operations. +Transpo's Break-Safe® Omni-Directional Breakaway System is for ground mounted signs located within roadside clear zones and other locations vulnerable to vehicular impacts. 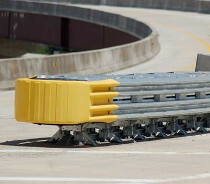 Transpo's Break-Safe® Omni-Directional Breakaway System is for ground mounted signs located within roadside clear zones and other locations vulnerable to vehicular impacts. +Screen-Safe® Glare Screen Safety Shield protects drivers and work zone crews from headlight glare and debris with a barrier fence. 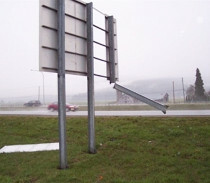 It is maintenance free and simple to install on guardrails and concrete barriers. Screen-Safe® Glare Screen Safety Shield protects drivers and work zone crews from headlight glare and debris with a barrier fence. 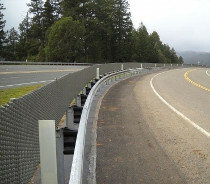 It is maintenance free and simple to install on guardrails and concrete barriers. 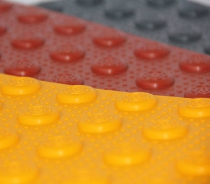 +STEP-SAFE® ADA detectable warning tiles and surface applied mats alert the disabled or visually impaired of approaching hazards particularly on sidewalks, curbs, subway and rail platforms, along travel routes, public buildings and other rights of way. STEP-SAFE® ADA detectable warning tiles and surface applied mats alert the disabled or visually impaired of approaching hazards particularly on sidewalks, curbs, subway and rail platforms, along travel routes, public buildings and other rights of way. +T-17 Methyl Methacrylate (MMA) Polymer Concrete Patching Material is designed for use on new construction and rehabilitation of bridge decks, expansion joints, bearing pads, and other concrete structures and is a 100% reactive, pre-packaged, two component solvent-free material system. 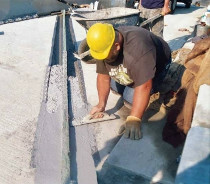 T-17 Methyl Methacrylate (MMA) Polymer Concrete Patching Material is designed for use on new construction and rehabilitation of bridge decks, expansion joints, bearing pads, and other concrete structures and is a 100% reactive, pre-packaged, two component solvent-free material system. +These treatments significantly increase surface friction re ducing run off the road accidents on hazardous curves. Transpo offers two binders for HFST, Transpo’s T-2 8 HFST Methyl Methacrylate (MMA) resin binder and Transpo’s T-526 HFST Epoxy resin binder. These treatments significantly increase surface friction re ducing run off the road accidents on hazardous curves. Transpo offers two binders for HFST, Transpo’s T-2 8 HFST Methyl Methacrylate (MMA) resin binder and Transpo’s T-526 HFST Epoxy resin binder. +Bondade® Asphalt Bonding Agent has been evaluated, proven and continuously used by agencies across the country for decades. It is a highly effective solution designed to promote adhesion of asphaltic materials to a variety of substrates. 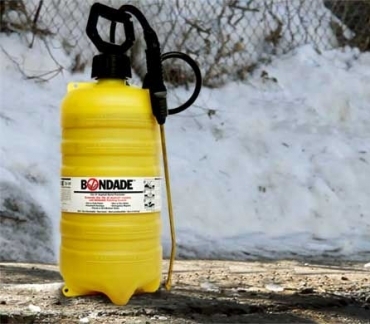 Bondade® Asphalt Bonding Agent has been evaluated, proven and continuously used by agencies across the country for decades. It is a highly effective solution designed to promote adhesion of asphaltic materials to a variety of substrates. +Visi-Barrier® is a highly visible barrier and strong stay-in-place form ideal for bench and wall panels. The precast polymer concrete barrier is available in modified shapes and provides extreme protection against corrosion and impacts. 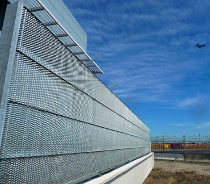 Visi-Barrier® is a highly visible barrier and strong stay-in-place form ideal for bench and wall panels. The precast polymer concrete barrier is available in modified shapes and provides extreme protection against corrosion and impacts. 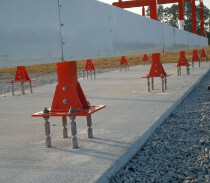 +BODAN® Highway-Rail Grade Crossing Surface is a precast reinforced polymer concrete crossing system used for highway/rail crossings and designed for heavy full speed traffic. Unlike other crossings, BODAN® does not rely on railroad ties for attachment or support. 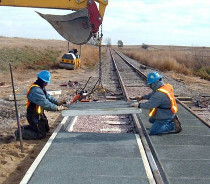 BODAN® Highway-Rail Grade Crossing Surface is a precast reinforced polymer concrete crossing system used for highway/rail crossings and designed for heavy full speed traffic. Unlike other crossings, BODAN® does not rely on railroad ties for attachment or support. 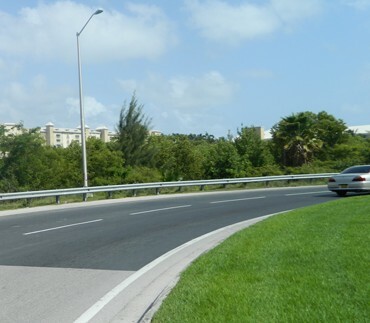 We have used your Color-Safe product on some of the roundabouts on island and it's amazing how well the product holds up to heavy traffic. Transpo did an excellent job. They are reliable, they listened and executed our needs. They made suggestions specific to our climate and location. They are great to do business with. I’ve got a couple customers that are going through the T-17 faster than I can keep them stocked. They come in and rave about your product. We deal with other materials manufacturers and your customer service and support makes us want to come back to you.